Max Weber was a funny guy! That’s right, Max Weber, the dour looking social theorist on the cover of your social theory text made jokes. How do I know this? 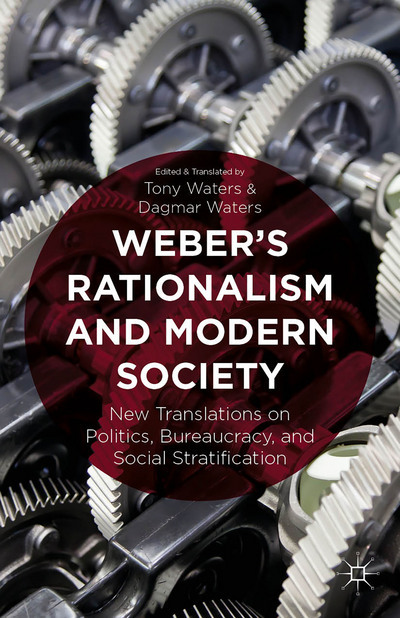 Well, my wife and I just published a new book Weber’s Rationalism: New Translations on Politics, Bureaucracy, and Social Stratification, and this post is an essay about why you should read it! In particular, Weber’s classic essay “Politics as Vocation” has real zingers in it. Vanity is a very widely spread trait and probably nobody is entirely free of it. Certainly, among scholars and academic circles it is kind of an occupational disease. Nevertheless, especially for a scholar, vanity is distasteful when it expresses itself, but it is relatively harmless because it does not disrupt the functioning of academic organizations. This is completely different in a politician for whom the pursuit of power is a means unto itself. (pp 181-182). I know, you are probably wondering what is so funny about that last one? What does he mean when he advises politicians to not make politics with either the soul or “other” parts of the body? What exactly is the “other” part of the body used to “make politics?” Anyway, I don’t think Weber was thinking of hands and feet! Politicians in those days too had fleshly temptations, and giving into them could only lead to poor political decisions, as generation after generation of politicians continually re-discover! Admittedly, the humor in our new translations is nestled among Weber’s more serious gems of insight which are couched in in more lofty prose. But wit and wisdom go together, and in our translations and the pages of accompanying editorial material, which we wrote, there are plenty of both. How prescient? President Bill Clinton said that “Politics as Vocation” was one of the 21 best books he had ever read—it is in the same list with his wife Hillary’s auto-biography! And there is more humor in “Politics as Vocation,” including endearing comments by Weber about men who blame their wives for their own affairs, and random potshots at political nemeses among the revolutionary politicians of 1919 Germany like Rosa Luxemburg, Karl Liebkencht, and Kurt Eisner, and even snarky remarks about politicians in the United States and Russia. But you need to get the book to read about these! Besides the rip-roaring oratory of Weber’s “Politics as Vocation, first delivered in the lecture hall of the University of Munich in 1919, in our book there are also new fresh translations of Weber’s classic essays “Class, Status, Party;” “Discipline and Charisma;” and “Bureaucracy.” All four translations are new, fresh, and littered with footnotes to help you understand both Weber’s wisdom and humor! Now for those of you convinced this is worth $90+ , you can have your copy of our new book delivered by Amazon.com either by the post office, or wirelessly to your Kindle. If you don’t have an extra $90+, you can tell your library that they cannot do without this book. Here is a convenient link from our publisher to recommend the book. Please click on this link and tell your library that they should indeed buy a copy so you can quickly check out the wit and wisdom of St. Max. A pre-publication version of Chapter 1 is here. ‹ PreviousSomething Happened At My Son’s School: Guns in a Backpack! Next ›Vanity as an Occupational Disease–Of Politicians (and everyone else)! Wit and Humour I dont see in the examples of Weber’s rhetoric. What I do see is a politically aware fiesty commentator which is interesting in itself. Certainly Weber was politically aware and feisty! But, I think if you have a look at our new translation, there are actual moments of humor (particularly saracstic humor). This is particularly the case in “Politics as Vocation” which was first delivered as a lecture in Munich. Given what is written in the idiomatic German he spoke in, I can imagine quite a few “Laugh Out Loud” moments during the speech!